Complete oxidizer systems designed to treat a wide variety of process flow rates and VOC concentrations. Air pollution control using a Thermal Oxidizer (also known as a Fume Incinerator) is appropriate in many process applications including processes where particulates may be present or have higher concentrations of Volatile Organic Compounds (VOCs). Pollutants like VOCs are emission issues that must be treated before being released to the earth’s atmosphere. Pollution Systems is here to help with all of your Thermal Oxidizer needs. 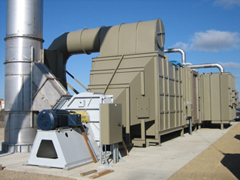 A Thermal Oxidizer can be likened to a burner in a box. First, VOCs are heated to a set point temperature and then oxidized (or burned). This process breaks down the VOCs to CO2 and water, both of which are acceptable to be exhausted into the atmosphere. Recuperative Thermal Oxidizers incorporate a heat exchanger with a combustion chamber and can handle a wide range of process flow rates and VOC concentrations. In this system, a heat exchanger is used to preheat the VOC-laden air prior to entering the combustion chamber to ultimately reduce operating cost. Destruction efficiency is typically in excess of 99%. New air requirements? Violations? Fines? If you are looking to improve your emissions, turning to Pollutions Systems is the first step in the process. Our engineers will carefully combine high quality designs and construction while focusing on reliability and ease of operation. Depending on your unique process requirements, custom energy saving options may also be available. Energy saving options may include the use of preheated combustion air, a secondary heat exchanger and/or sophisticated burner controls. Pollution Systems will work closely with you to understand the trade-offs between the initial capital investment and the expected savings in future operating costs. Some of the more common industrial applications for Thermal Oxidizers include Corn Processing Facilities, Fiberglass & Composite Industries, Beverage Can Manufacturing, Process Coating and Laminating, Chemical Processes and Metal Finishing Operations.